This Lunar Eclipse Calendar is a listing of all Lunar Eclipses for 2017 & 2018. The calendar below shows the date of each Lunar Eclipse as well as the type of Eclipse and general viewing area. 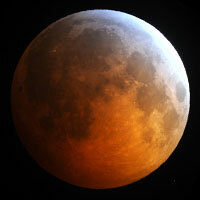 There are basicly 3 types of Lunar Eclipse, Penumbral, Partial and Total Eclipse. Total Eclipse - Will be visible in South America, Europe, Africa, Asia and Australia. A Lunar Eclipse occurs when the Moon passes through the shadow of the Earth. For this to happen the Sun, Earth, and Moon must be closely aligned with the Moon and the Moon located furthest from the Sun. There are a few different types of Lunar Eclipse that are determined by where the moon is in relationship to the shadow of the Earth. A Total Eclipse occurs when the moon is completely blocked from the sun. When the Moon is in this location it is in the Umbra region of the Earth's Shadow. 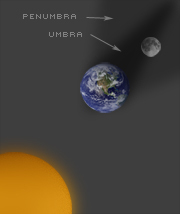 The Umbra is darkest region of the Earth's shadow and recieves little or no solar radiation. While other types of Lunar Eclipses can be viewed in wide regions of the earth the part of the eclipse that is "Total" is viewable is a much smaller region. The same can be said for the duration of the Eclipse. An Ecplise can last around 3 hours but the time that it is full is generaly around an hour or less. A Partial Eclipse occurs when the moon partialy enters the Umbra shadow of the Earth but is no completely blocked from the sun. When the Moon is in this location it is partialy in the Penumbra and partialy in the Umbra on the Earths Shadow. The effect that this type of Eclipse has when located on Earth is that the Moon is partialy shaded on one side. The shaded side of the moon is the darkest part of the earths shadow(Umbra). Partial Eclipse are generally visiable in a wide area of the earth. 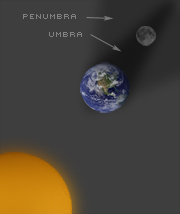 A Penumbra Eclipse occurs when the moon only enters the Penumbra area of the Earth's shadow. 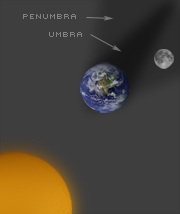 The Penumbra is a region of the shadow that is not completely obsured from the rays of the sun. This lighter shadow is a result of the relative size of the Sun to the Earth. This type of Eclipse causes the moon to only darken slightly when viewed from earth and is one of the less dramatic Lunar eclipse.